Regency at Palisades is an active lifestyle community in Charlotte, North Carolina. This 413-home neighborhood is part of the master-planned community called The Palisades, a country club community located on the gorgeous shores of Lake Wylie. Regency at Palisades offers low-maintenance living at its finest. Homes were designed for homebuyers looking for first-floor master suites and open floor plans. Features in these models are second to none and add a luxurious charm to all homes. 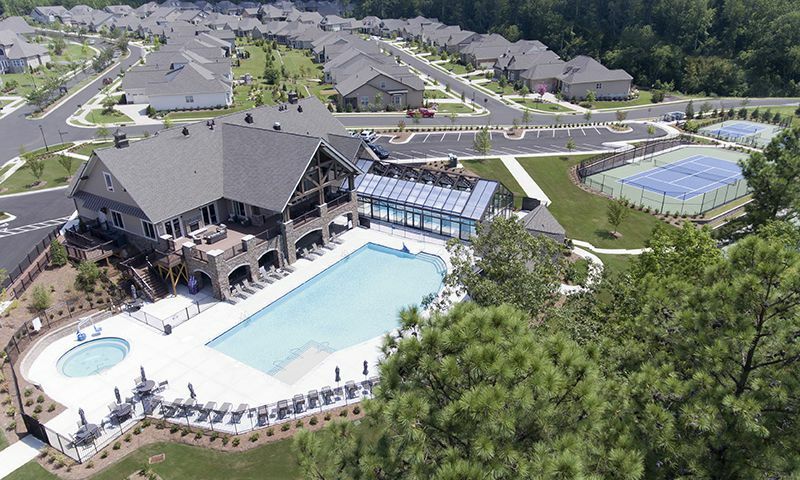 The community has a private, 12,000 square-foot clubhouse exclusively for the residents of Regency at Palisades. Amenities include a state-of-the-art fitness center, multi-purpose room, hobby and game room, outdoor and indoor pools. Outdoor amenities include tennis, pickleball, and bocce ball courts as well as access the beautiful Lake Wylie. Currently, residents of Regency at Palisades have the option to join the Palisades Country Club. The Palisades community residents have miles of recreation with access to a nature preserve, Lake Wylie for boating activities, and more than 4 miles of beautiful trails. Homes offered in Regency at Palisades come in elegant designs, all with first-floor living with optional second floors. Ranging from about 2,000 to 3,000 square feet, these homes feature over-sized bedrooms and low-maintenance exteriors. Each home has at least two bedrooms, two bathrooms, and an attached two-car garage. Well-appointed features such as hardwood flooring and granite countertops give these homes a touch of elegance. Residents of Regency at Palisades enjoy an active and low-maintenance lifestyle. Not having to manage the home's exterior such as lawn care frees residents up to enjoy the great lifestyle in the community. With clubs and activities meeting daily there is always something to strengthen your mind or body. Regency at Palisades is located near the North Carolina and South Carolina border close to the Charlotte area. This area provides endless opportunities for dining, shopping, and entertainment. Residents of the community enjoy the beautiful shores of Lake Wylie where boating, fishing, and swimming are all enjoyed by those living in the area. Sports fans will thrive on the local professional sports scene with the Charlotte Hornets NBA team and Panthers NFL team. The beautiful surroundings and endless opportunities for entertainment make the Regency at Palisades a top-notch community. Residents of Regency at Palisades have the option of joining the Palisades Country Club. Both social and golf memberships are available at this private club. The Palisades Sports Complex is located just down the street of the Palisades Country Club. Residents of Regency at Palisades have full use of the sports complex. There are plenty of activities available in Regency at Palisades. Here is a sample of some of the clubs, activities and classes offered here. Homes offered in Regency at Palisades range from 1,933 to 2,628 square feet. Homes have at least two bedrooms, two bathrooms and an attached two-car garage. Beautiful finishes and low-maintenance exteriors make these homes top choices among active adults. We had been looking for places to downsize for 3yrs and could not find anything that met our criteria. Regency at Palisades had it all; great models to choose from, many options for design, near lake, golf course community, great medical options, close to shopping, 20 min to downtown Charlotte and a regional airport. The only downside was the amount of time it took to build. It wound up taking 10 months instead of 6. As they continue to build the completion time is getting better. Quality of materials is outstanding. 55places.com is not affiliated with the developer(s) or homeowners association of Regency at Palisades. The information you submit is distributed to a 55places.com Partner Agent, who is a licensed real estate agent. The information regarding Regency at Palisades has not been verified or approved by the developer or homeowners association. Please verify all information prior to purchasing. 55places.com is not responsible for any errors regarding the information displayed on this website.